The U.S. Census Bureau estimates there were 154,000 stay-at-home dads as of 2010. The Census Bureau releases a press release on Father’s Day each year summarizing the number of stay-at-home dads under the heading “Mr. Mom”. This heavily-cited release is based on raw data called the Families and Living Arrangements analysis of the Current Population Survey which is conducted in March each year. The data used in the press release on stay-at-home dads comes from the current Families and Living Arrangements page, Table SHP-1 (70% to the bottom of the page). 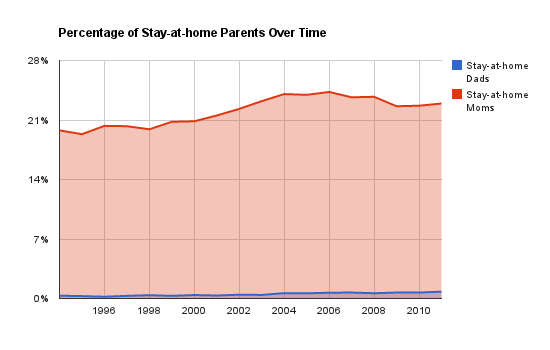 Table SHP-1 shows data on stay-at-home parents from 1994 until 2011. 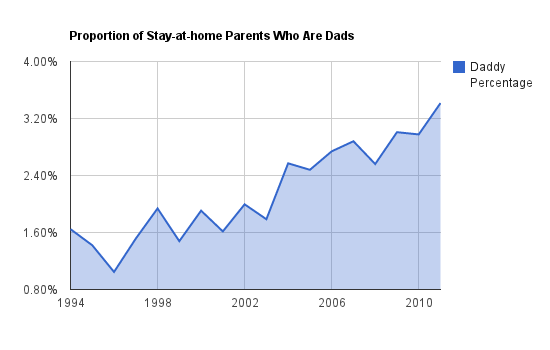 The percentage of stay-at-home moms dwarfs the percentage of stay-at-home dads. Although the trend line of stay-at-home dads in increasing in the top graph, viewing a graph of the percentage of stay-at-home dads by itself presents a clearer picture. The graph below shows the percentage of stay-at-home dads relative to the total number of married couples with children under the age of 15. The trend shows that the percentage of parents who are stay-at-home dads has more than doubled since 1994. Finally, the third graph shows the percentage of stay-at-home parents who are dads. In other words, first we add up the total number of stay-at-home moms plus the total number of stay-at-home dads. Then we determine what percentage of that total are stay-at-home dads. 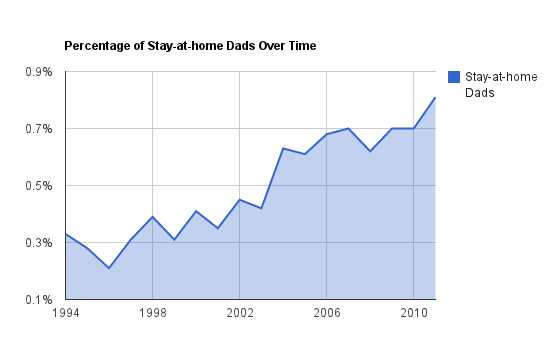 In 2011, 3.42% of stay-at-home parents were stay-at-home dads.